Color(s): Brindle; Black with streaking. May have a small amount of white on chest or feet. 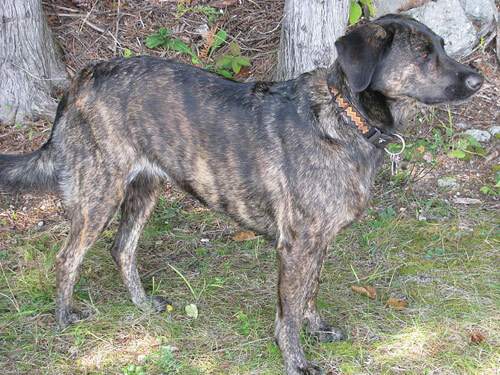 Originating in the United States of America, the Treeing Tennessee Brindle breed is a favorite hunting companion. Noted for their powerful scenting abilities, this breed is highly skilled in trailing, locating, and treeing squirrels and raccoons. Although this breed has been used for many generations, Treeing Tennessee Brindle's were not officially given a name until 1967 and are slowly, but steadily gaining in popularity. Built for speed and intelligence, the Treeing Tennessee Brindle is smaller in size than other typical Hound breeds. They are courageous, well-built, possess cat-like feet, and small ears. This is an unpretentious breed that are often referred to as the breed that have "heart and try" in abundance. The Treeing Tennessee Brindle breed is affectionate, loyal, and easy-going. They are passionate hunters that possess great spirit. This breed does well with other dogs, but is not recommended for a home with non-canine pets. Treeing Tennessee Brindle's do best with older considerate children. Their exuberance may be overwhelming to small children. They are highly energetic, cheerful, and enthusiastic. The Treeing Tennessee Brindle will bark to alert their family to suspicious activity. They make wonderful hunting and family companions. Care The Treeing Tennessee Brindle breed requires regular brushing with a firm bristle brush to remove loose and dead hair. Bathing should only be done when absolutely necessary. It is important to routinely check the ears for debris and to keep the nails trimmed. This breed has no known health issues. The Treeing Tennessee Brindle's coat is smooth, sleek, dense, and short. They are an average shedder. The Treeing Tennessee Brindle is extremely sensitive. They will not respond to harsh or heavy-handed training methods. If training is done with neglect or abuse there are catastrophic consequences, for this is a breed that is all "heart". Training must always be done with respect, love, fairness, and consistency. Treeing Tennessee Brindle's do well with obedience and socialization. The Treeing Tennessee Brindle breed is not recommended for apartment dwelling. They are highly active and require a rural setting where they can free roam to hone their hunting skills. They enjoy time with their family and prefer to be outdoors.